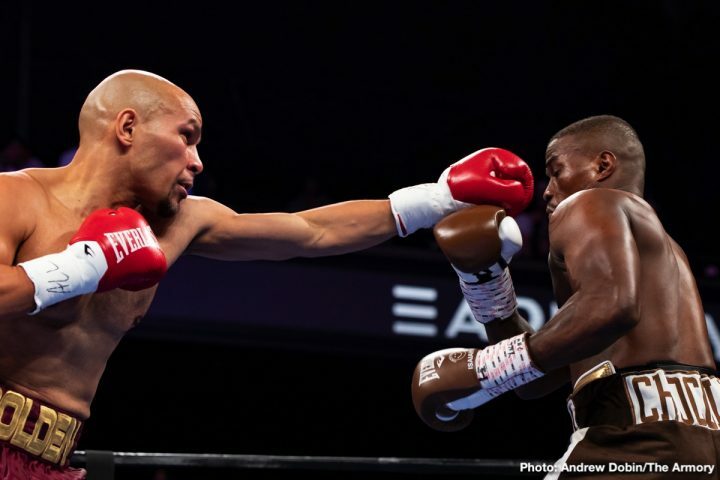 By Mike Smith: In a battle of former world champions, Caleb Truax (30-4-2, 19 KOs) suffered a bad cut from a clash of heads in the second round of his fight with Peter “Kid Chocolate” Quillin (34-1-1, 23 KOs) which made it necessary for the fight to be stopped and ruled a no decision at The Armory in Minneapolis, Minnesota. 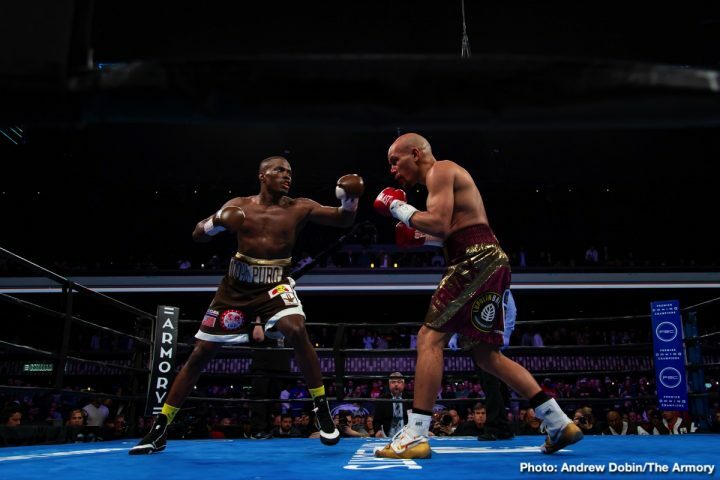 The fight was televised on Premier Boxing Champions on FS1 & Fox Deportes. 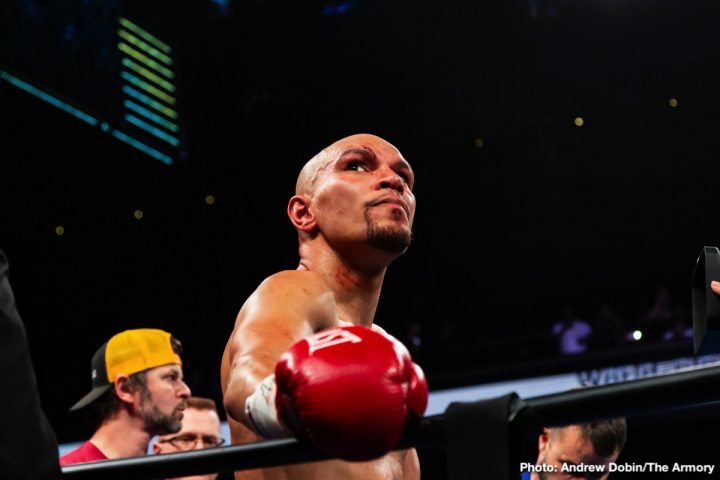 It wasn’t surprising that Truax, 35, was cut, as he and Jacobs were doing a lot holding during the two rounds of action. Needless to say, it was a disappointing ending for the headliner fight at The Armory. 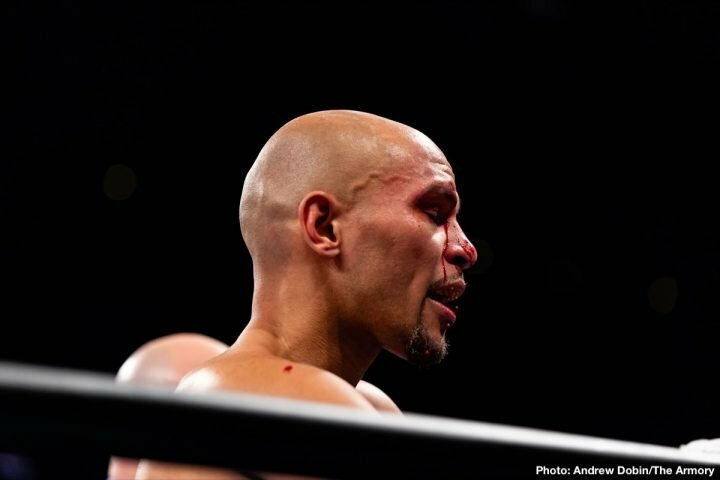 In the second, Truax was cut badly over his right eye when he clashed heads with Quillin, 35, while holding. The cut was bad, and it was clear that the fight needed to be stopped on the spot. 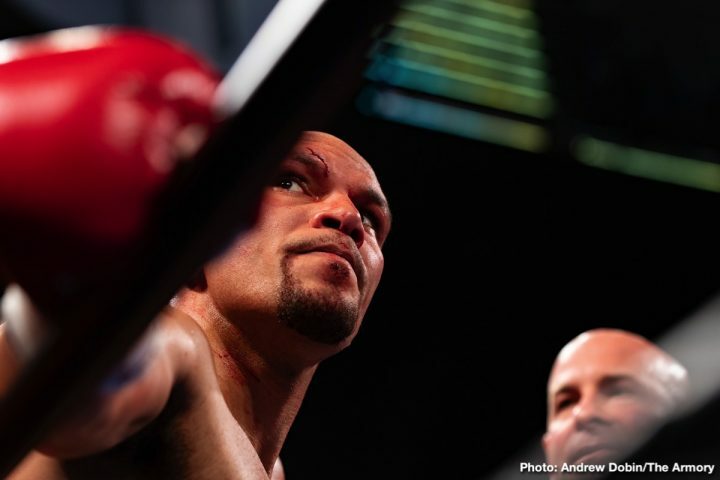 The ringside doctor made the determination that the fight should be halted after he examined Truax’s cut. With the fight ending prematurely, it’s unclear whether the two will face each other in a rematch. 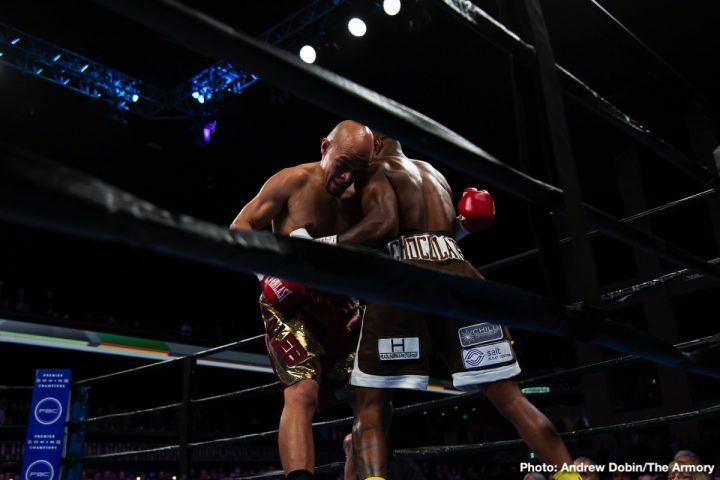 With all the holding the Quillin and Truax were doing, if they fight each other again, someone is going to wind up getting cut again, because the two of them were grabbing each other, and not letting their hands go. 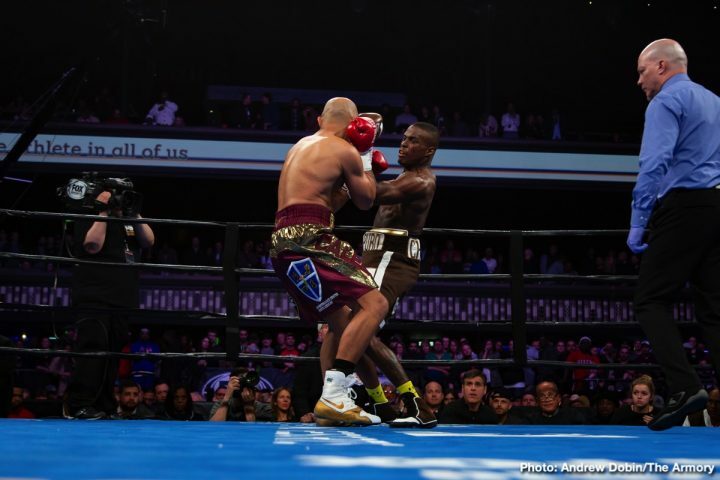 Quillin needs to be fighting guys that don’t hold like Jose Uzcategui or Chris Eubank Jr. 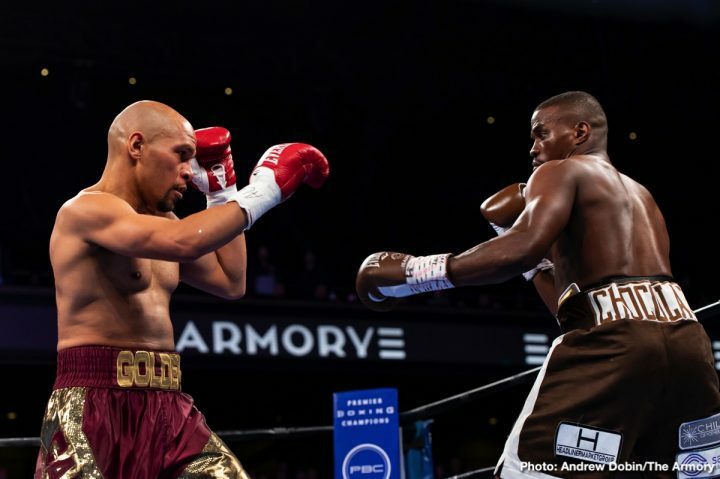 Given that tonight’s fight was an IBF super middleweight title eliminator, there’s a good chance that a rematch will be put together so that the two can try and earn the mandatory spot with the International Boxing Federation to get a title shot against champion Caleb Plant. The boxing fans can’t be too happy that paid to see the Truax vs. Quillin fight live tonight at The Armory in Minneapolis. 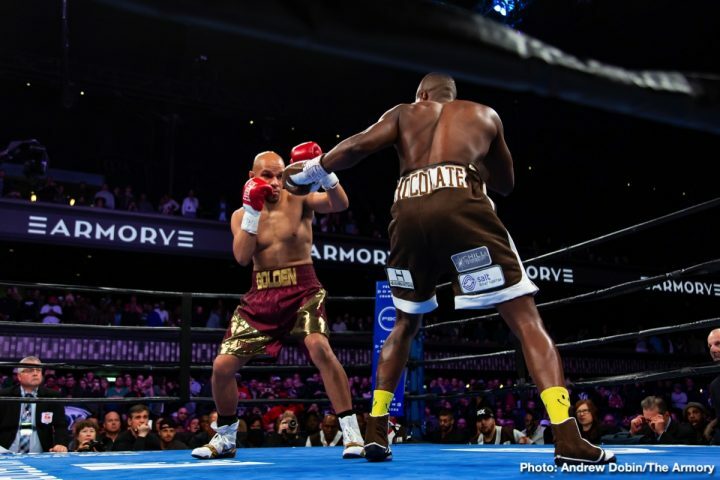 The fans will have to be satisfied with watching the co-feature bout between middleweights Sergiy Derevyanchenko and Jack Culcay, neither of which come from Minnesota. 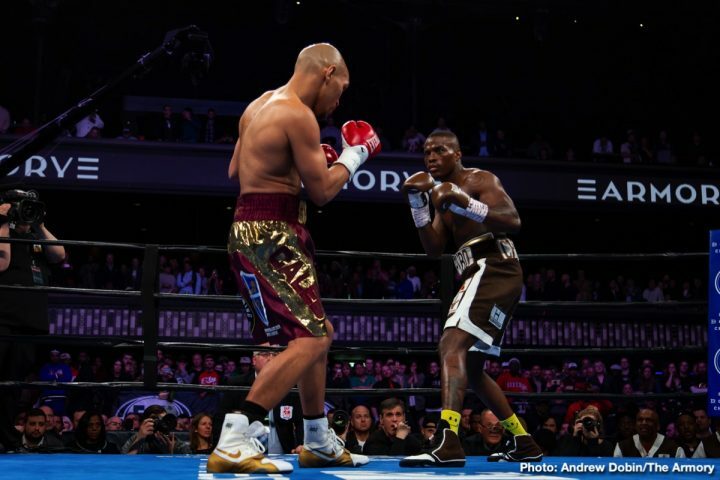 It’ll be interesting to see if the IBF has Quillin and Truax fight a second time in an IBF super middleweight title eliminator. With the way these two fighters were tying up tonight with clinching, could see the same ending in the rematch. Former middleweight world title challenger Sergiy Derevyanchenko (13-1, 10 KOs) beat Jack Culcay (25-4, 13 KO) by a hard fought 12 round unanimous decision in an IBF middleweight title eliminator. 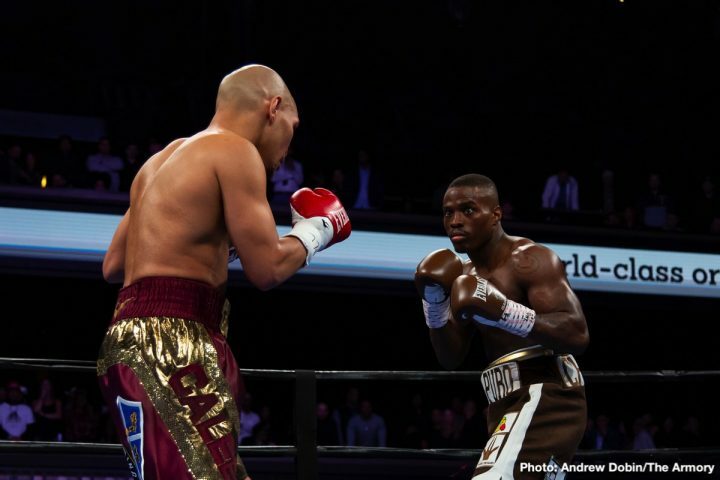 Derevyanchenko fought hard, landed the harder shots to earn the decision by the scores 116-112, 116-112, and 115-113. Culcay fought hard to get back into the contest in the last half of the bout. He was too far behind for him to catch-up and even the fight out. Derevyanchenko looked tired in the last four rounds, and was hurt in the 11th, but he fought well in the 12th to preserve his victory. 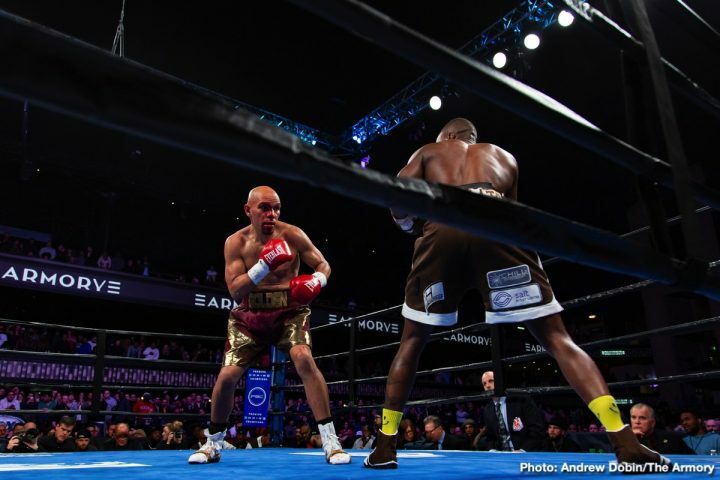 The win now makes Derevyanchenko the IBF mandatory challenger to Daniel Jacobs, who recently beat him by a 12 round decision last October in a fight for the vacant IBF title. With any luck, Derevyanchenko will get a chance to fight Jacobs a second time and avenge his loss. Derevyanchenko would likely prefer to face Saul Canelo Alvarez.